So, you use a suction meter to ensure that the suction rate at idle is unison among the six throats. What happens when the foot goes on the throttle? How do you know that the suction stays unison? I'd be interested in learning the tricks others may have discovered? Thanks. use of "flow-meter" is only to help synchronize carbs at idle circuit and becomes irrelevant as soon as the throttle is opened slightly, since at this point the idle circuit gets transitioned off use. And as Mike pointed out, off-idle balance between the carbs is achieved with properly adjusted linkage. Timo, true that he idle circuit gets transitioned off use, but there is a short RPM range during the time that the foot gets off the clutch and the revs are rising that if you do not have perfect suction you'll get engine vibration due to ununiform feedinto the cylinders. So, to get a smooth rev up to the point that idle circuit is off use, uniform suction is important. John Vardanian wrote: ...there is a short RPM range during the time that the foot gets off the clutch and the revs are rising that if you do not have perfect suction you'll get engine vibration due to ununiform feedinto the cylinders. John, with all due respect, but such symptom(s) would suggest, at least to me, that Your engine might not be properly tuned/adjusted (carbs, linkage, ignition or cam timing, etc...) or might have some other internal issues (compression, valve adjustment, etc...). Nope, the vibration is due to an uneven suction between 700 RPM and 1800 RPM. John Vardanian wrote: Nope, the vibration is due to an uneven suction between 700 RPM and 1800 RPM. Very interesting. Would You care to share in detail, what exact methods are being used to establish these findings ? Timo wrote: Would You care to share in detail, what exact methods are being used to establish these findings ? I would elevate the idle rpm on 1000. All Afrench and Timo advice is correct. I would take out the Fispa 3 round filters and test the fuel pressure. and last but not least replace the four rubber motor bocks/studs. Hello all, I thought I'd report that I got to the bottom of my vibration problem. 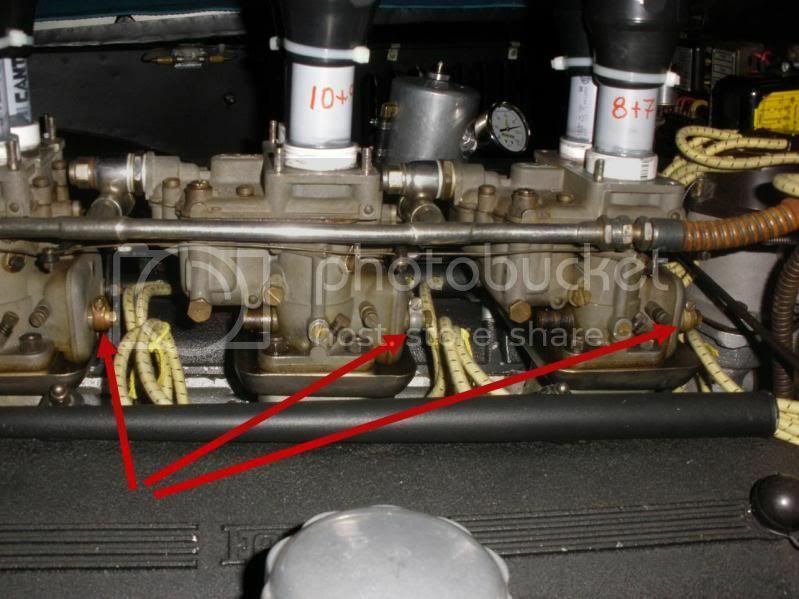 The collar on the front carb is different from the other two, as you can see in these pictures. It would not grasp the shaft well enough and the shaft would rotate at its own will as opposed to in harmony with the parallel shaft. I am pretty sure this one collar came from something else. For now I have placed a brass shim between the collar and the shaft (as you can see in the second photo) and it works fine, maybe some day I'll finds the correct collar. As to how I found the problem, well you can see from these pictures. 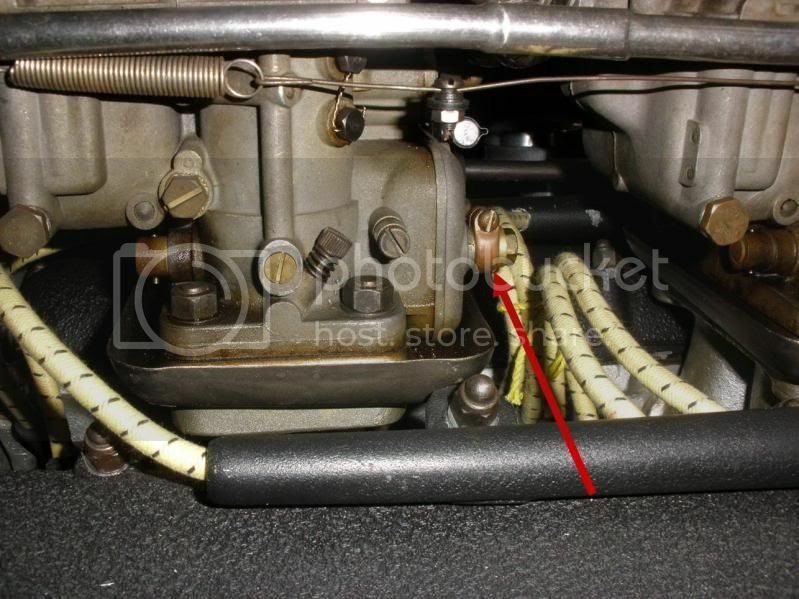 The turnbuckle proved to be an excellent tool for keeping the engine RPM at constant above idle, allowing one to play around with the carb linkages to get even flow among the carbs. Based on what Mike Pierce did on my PF coupe carbs, the brass collars are original, while the current replacements are aluminum. I'll check and make sure that the couple of replacements on my carbs are tight. So, Kerry, are you saying that the middle and rear carbs have unoriginal collars? These function well enough on mine. John Vardanian wrote: So, Kerry, are you saying that the middle and rear carbs have unoriginal collars? These function well enough on mine. No, the aluminum one on the middle carb is the current replacement part available from Weber. On my 40DCZ/Ls, all the clamps are original die-cast zinc (Zamak). Using the same material throughout negates problems with differing rates of expansion. We had an Aurelia Convertible that came in with a loose clamp. It idled just fine, but was a bit anemic running on three cylinders at speed. Missing half your motor makes more of a difference than missing two out of twelve, but the owner, a restaurateur more interested in cosmetics than performance, just thought it was normal. He was amazed at the difference. A year later he brings it back in, the clamp is slipping again, and he hasn't noticed. But it is well waxed. Hello John, that was a real waste of money to buy 6 synchrometers ! those carbs cannot be work like a fuelinljection system and be happy about that. those carbs only have two adjust possiblities : vacuum and mixture. when you synchrone one side of a DC carb the orther side is autiomatically influenced a bitt. So you must make a compromise for both side! that means you can do this only ONE synchrometer. the mixture can be do by colortune but is a lot of work. 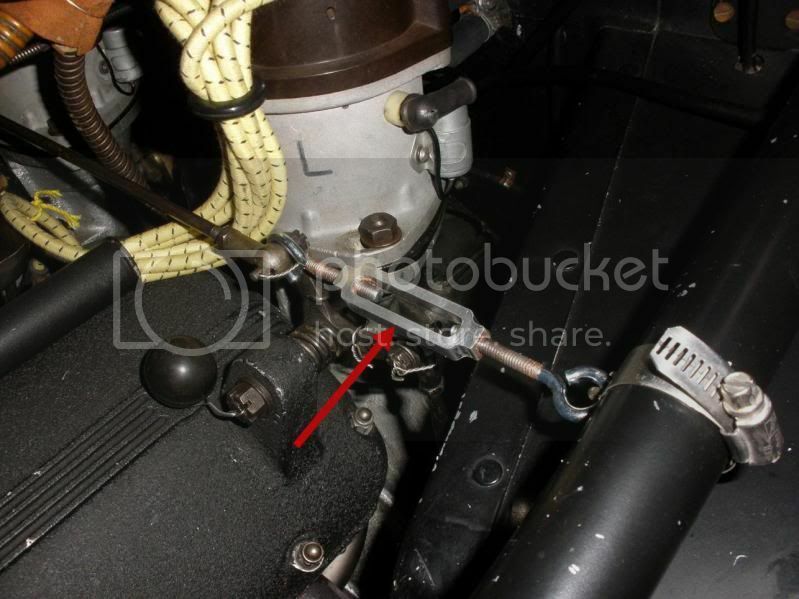 This is how I do it : turn in the mixture screw compleetly now, the warm engine runs on 12-2 cyl thats 10 cyl. The vacuum check will show EVERY 100 miles a deviation to the first adjustment !!!! don't expect more, that the reasom why carburators car are not biuld any more ( polution). 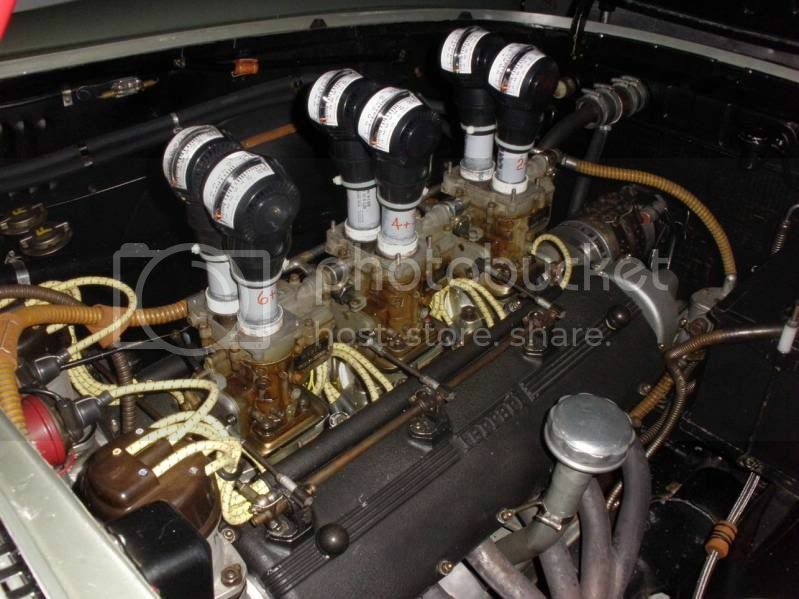 I just bought from Mr. Bosch two Auxiliary Air Valves for two cars of mine ( D- jetronic systems). Total cost for these very simple parts 2200 euros without P&P.